THE ERA OF BIG BOILERS IS OVER! 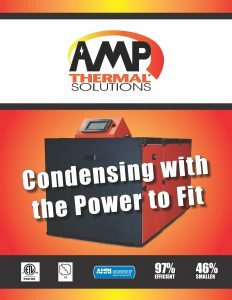 AMP, the new condensing boiler series from Thermal® Solutions providing unprecedented MAXIMUM output in MINIMAL space. Who said bigger is better? Our series averages 46% less required space than competitive models with 97% Thermal Efficiency. With an optional racking system, you can place twice the BTU’s in the same footprint! The pace of change and improvement is relentless, yet somehow commercial condensing boilers have been immune. With so many imitations in the marketplace, perhaps the “me too” became standard in the industry. AMP provides efficient and compact design coupled with minimal piping requirements, distinguishing boiler rooms for years to come. Start the New Era today with Thermal Solutions! Click on the Brochure or Contact Us to learn more.